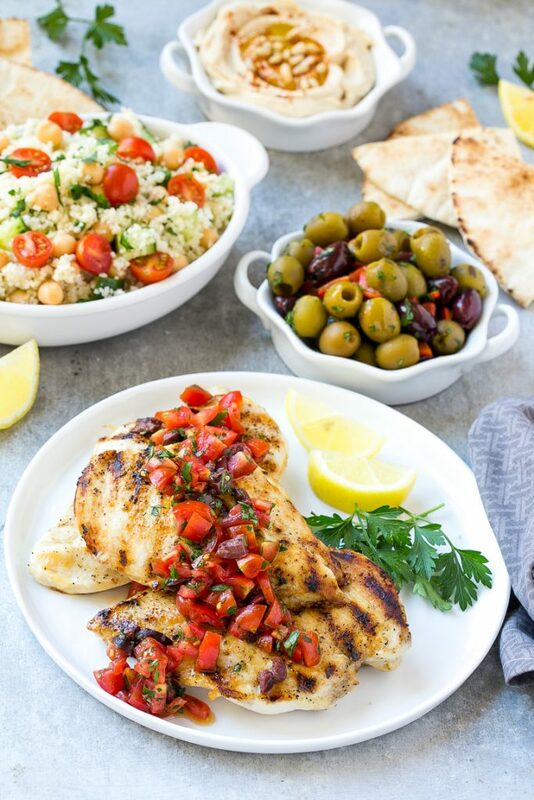 This recipe for Greek lemon chicken is marinated chicken that’s been grilled to perfection and topped with a bright and delicious tomato and olive relish. The perfect dish for entertaining! I’m always creating new grilled chicken recipes because we grill chicken all summer long! This Greek chicken is one of my all time favorites, it’s easy, quick to make and totally delicious. This post has been sponsored by Google Express. Thank you for supporting the brands that make Dinner at the Zoo possible! This Greek lemon chicken has got to be my new favorite meal for company. 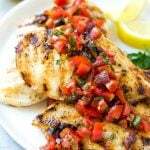 The chicken is packed with lemon and herb flavor, and the 5 minute tomato relish just adds so much extra flavor. Best of all, it’s ridiculously easy to make; add a few simple sides and you’ve got a Greek feast fit for any occasion! How do you make Greek lemon chicken? The first step for this recipe is to marinate the chicken in a mixture of olive oil, lemon juice and herbs. I use thin cut chicken breasts because they cook quickly. While the chicken is cooking, I whip up a super simple olive and tomato topping. Combine the two and you’ve got grilled Greek chicken with tons of flavor! 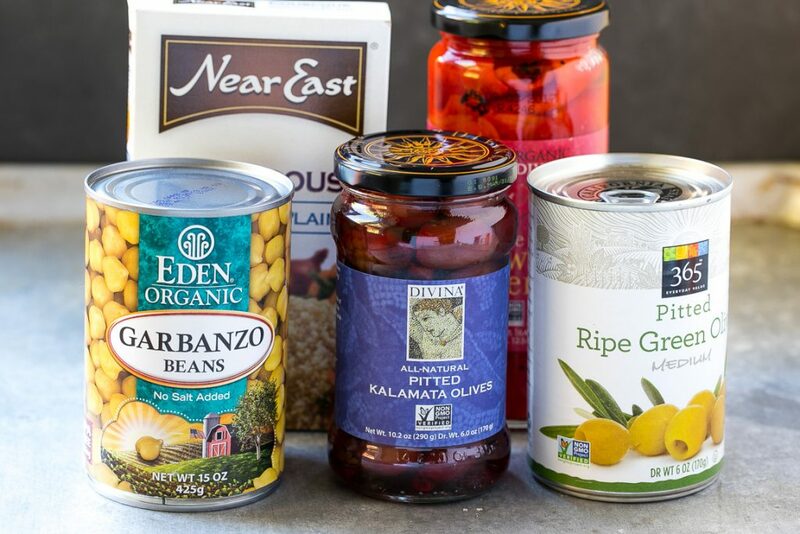 No meal is complete without some amazing side dishes. I got an assortment of olives, roasted peppers, pita bread, chickpeas, olive oil, couscous and a few other ingredients to transform my Greek lemon chicken into a full meal that was fit for company. Don’t have a grill? No worries! You can cook the chicken indoors on a grill pan, or simply saute it in a skillet. You can also use chicken tenders instead of chicken breasts if you prefer. I added some store bought staples to round out the meal like hummus, pita bread and olives that I marinated with roasted peppers and olive oil. I also put together a quick couscous dish with chickpeas, vegetables, and more lemon and olive oil flavors. The meal was a huge hit – we had a fun and relaxing meal at home with our friends. I wasn’t at all stressed and didn’t spend the entire day at the grocery store thanks to the convenience of Google Express. Greek chicken is easy enough for a busy weeknight, especially if you take some shortcuts and buy some sides like I did. Another great option would be to pair this chicken with a cucumber and tomato salad or a rice pilaf. 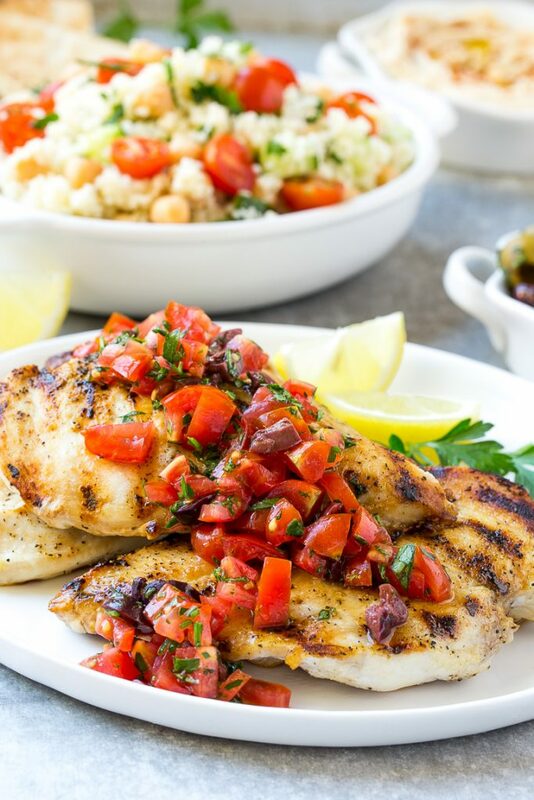 This recipe for Greek lemon chicken is marinated chicken that's been grilled to perfection and topped with a bright and delicious tomato and olive relish. The perfect dish for entertaining! In a large resealable bag combine the olive oil, lemon zest, lemon juice, sugar, garlic, oregano and salt and pepper to taste. Seal the bag and shake to mix all of the ingredients together. Add the chicken to the bag and marinate for at least 30 minutes or up to 4 hours. Heat a grill or grill pan over medium high heat. Add the chicken and cook for 4-5 minutes per side or until cooked through. Cook time will vary depending on the thickness of your chicken breasts. Combine all of the ingredients in a medium bowl and stir until thoroughly combined. This can be made up to 4 hours in advance. Place the chicken on a platter and spoon the tomato relish over the top. Serve with lemon wedges and parsley sprigs for garnish if desired. What did you do to marinate your olives as shown on the side of the chicken? They look yummy! They’re mixed with olive oil, diced roasted red peppers and parsley! Great looking chicken and I’m interested in the Goggle delivery! I made this today and it was awesome! Served it with warm pita bread! I love the colors in this dish – so vibrant and beautiful! This sounds like a great service and a terrific meal. Makes me want to have company so I can make this! Beautiful dish and I like that Google service idea! Is that a Tobouli side dish? So you have a recipe for that? Wow! What a great service and a great dish! How interesting Sara, did not realize there was a program like this available. 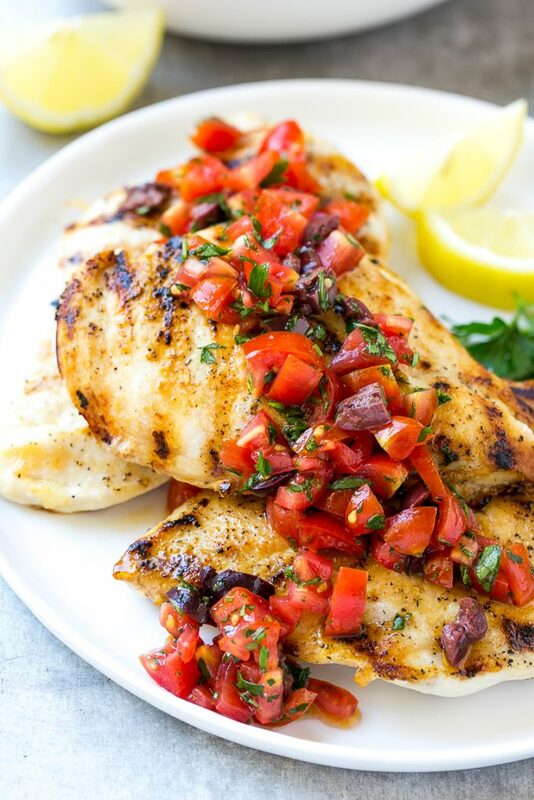 Love your Greek lemon chicken, there is nothing like the taste of sweet summer tomatoes.